+ DO YOU OFFER FREE TRIAL CLASSES? Yes! Your child is welcome to try out a Busy Bookworms class before you commit to booking for the term. Click here to book your free trial. + HOW LONG DOES EACH PROGRAM RUN FOR? Busy Bookworms classes are 1.5 hours long. + HOW MUCH DO BUSY BOOKWORMS CLASSES COST? Busy Bookworms classes cost $35 each. We often run special offers – for 2019, we are offering 20% off your first term, or 25% if you refer a friend who signs up! + HOW OLD DOES MY CHILD NEED TO BE TO ATTEND BUSY BOOKWORMS? Busy Bookworms classes are for 3-5 year olds. If you'd like to book a free trial, click here. + DO YOU RUN CLASSES DURING THE SCHOOL HOLIDAYS? Busy Bookworms terms are aligned with the Victorian School Terms, and we do not run classes over the holidays. + DO THE CHILDREN HAVE A BREAK OR ANY FOOD DURING THE CLASS? At Busy Bookworms we aim to pack so much into each class that there’s no time for a snack break! While the classes are relatively short, please make sure your children have had a snack and been to the toilet before class begins. If a child needs the toilet during class, a bathroom break will be arranged by the teacher. + HOW MANY CHILDREN IN EACH CLASS? 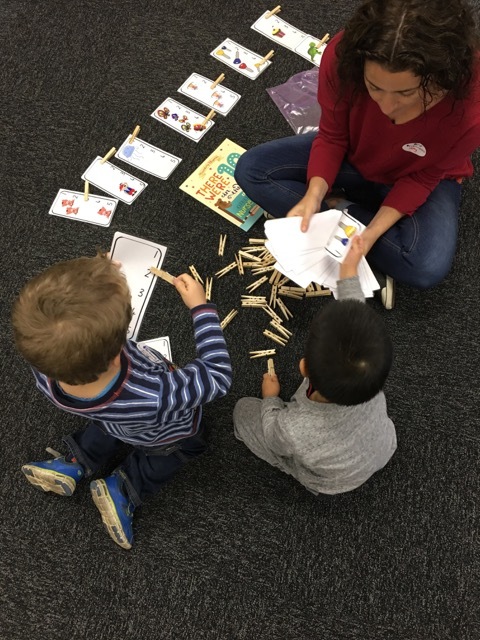 Busy Bookworms has a maximum of 8 children per class, to ensure that each child is able to receive plenty of individual attention and support. + HOW CAN I ENROL? Call us on 0408 530 450 - we will take enrolment information over the phone and send a confirmation by email, including bank details for payment. All enrolments are subject to availability only. + DO I ENROL FOR A TERM OR THE WHOLE YEAR? We take enrolments on a term by term basis, however you will be given an opportunity for preferential enrolment for subsequent terms – we will notify you of the re-enrolment period each term, so that you can secure your place the following term, before we open enrolments up for new students. + CAN THE GROWN-UPS STAY IN THE CLASSROOM? Busy Bookworms is a “drop off” program, so we ask that parents and carers leave once the children are settled. Past experience has shown us that when some children's parents stay, other children may become upset that their parents aren't also staying. Dropping off is a great way to encourage independence, however if your child is experiencing some separation anxiety you are more than welcome to wait within the centre for the duration of the class. + CAN I GO ON A WAITING LIST IF THERE ARE NO PLACES AVAILABLE IN MY PREFERRED CLASS? Of course! We take your details for our waiting lists and will notify you if a place becomes available. + HOW DO I PAY FOR THE CLASSES? Payment for each term’s booking is by bank transfer – we will send you details with your enrolment confirmation email. + WHAT HAPPENS IF MY CHILD NEEDS TO MISS A CLASS FOR SOME REASON? While we are unable to offer make-up classes, we will keep copies of the week’s handouts for your child so that you can enjoy the books together at home. + WHAT IF MY CLASS FALLS ON A PUBLIC HOLIDAY? Busy Bookworms’ terms generally finish one week before the end of Victorian school terms, to allow us to make up any classes that were missed due to public holidays.